Hawaii artist Jeff Gress on the second day of the festival sporting a POW! WOW! t-shirt and explaining the plans for his mural. Gress’s completed mural near the corner of N and First Streets NE. 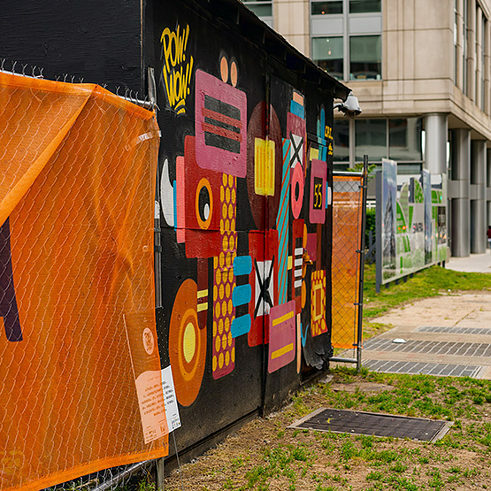 DC artist Juan Pineda, aka CRI, painted this shed on M Street NE in NoMa for the 2017 festival. Kelly Towles took on the same shed for this year’s festival. The 2018 POW! WOW! 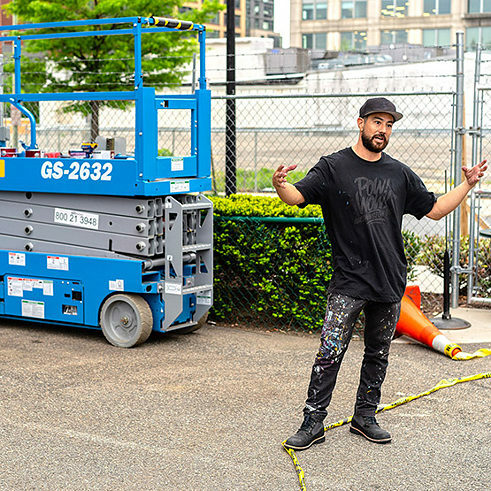 DC Mural Festival has now wrapped up, leaving behind over 20 new works of street art in and around Washington’s NoMa neighborhood. The festival’s director Kelly Towles has been active in the D.C. art scene since the late 1990s. His pieces can be seen throughout the area in businesses, galleries, on walls and garage doors. Along with the large task of running this year’s festival, he also took part by covering a shed on M Street NE with a new mural. Hawaii artist Jeff Gress has long been active in the POW! WOW! Worldwide community. He helped Towles host the 2017 POW! WOW! DC Mural Festival, but for 2018 he returned to enjoy the festival strictly as an artist. The scale of his contribution this year required his full attention. 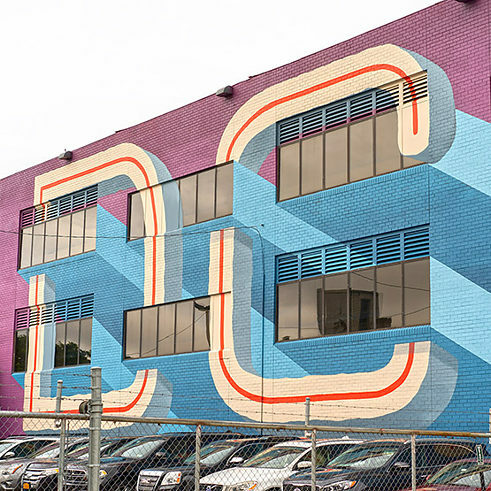 His massive blue and purple “DC!” mural off N Street NE completely covers three stories. Check the map of locations on the POW! WOW! DC website to ensure you see the murals in their beginning state. Street art is almost always a transitory form, and these murals will face many hazards. While many graffiti artists and taggers would never use someone else’s mural as a canvas, there are some who do. There is also always the possibility of murals being painted over or lost when a wall is demolished to make way for new construction. ©Josh Mike Maguire is a Washington, D.C. photographer and writer. His photos have appeared in The Washington City Paper, The Baltimore Sun, USA Today, and Thrasher Magazine. A native of the D.C. area, he loves photographing the city's nightlife and street art.